Frisco, NC sound fishing / gigging ? general info on the area? boat ramp? there looks to be a pay ramp...any free ones?? food? any places to try or avoid?? There can be decent fishing and gigging on the reef that's about 2- 2 1/2 miles from the canal entrance. Not sure what the water looks like with 20"+ of rainfall in the past month down there. Last edited by twitch; 08-07-2018 at 01:47 PM. roger that, are you talking about bird island to the north? Ramps in Hatteras are at Teach's Lair or Village Marina. $10 to launch. Check out fishingstatus.com for inshore/sound fishing reefs/spots. Water clarity wasn't too bad inshore/nearshore for all the rain. Just got back from there Sunday. Things should improve with the good weather this week. We've done well in the past just drifting squid strips on bare hooks for flounder in the channels. Catch an occasional drum that way too. Drum fishing is in/near the inlet as far as I know. Trout are around somewhere, but I haven't figured them out yet. The nearest ramp to your rental is at Scotch Bonnet marina, but a lot of the houses in your neighborhood have them too. Google "Saltwater Series Hatteras" for a Sportsman article from a while back with some info. The reef mentioned above is #4 in the article. The channels down by the inlet have been the most productive for me. There's no free ramp in that neighborhood unless you make friends with a resident that has one. There's a pay ramp at the Scotch Bonnet. Not much tide swing near your rental, water level is mostly wind driven. Familiarize yourself with the area before you start tearing across the sound- lots of skinny water (like ankle deep) but it's pretty easy to pick out once you know what to look for. Good luck. I've rented on that street before. That is a real nice neighborhood. If you go due west of the neighborhood you can catch speckled trout in that area. I have fished it in my kayak and done OK there, especially early or late in the day. If you look at the satellite shot of that area, you will see an area of deep water just a few yards off of the bulkhead on the west side. Heading west, the water shallows up for a ways and then drops back off. In the area where it drops back off is where I have caught the trout. I use light jig heads and Berkley gulp swimming mullet baits. I keep my 25 foot boat in Village Marina when we are there and I have fished all along the ferry channel out towards the inlet. If you look at the satellite shot you can see the shoals and channels. I've caught flounder in that area, but I know folks who know what they are doing also catch drum and trout not too far from Hatteras village. I've had some luck on the artificial reef north of the neighborhood you are staying in, but have never done real well there. I know lots of folks fish it though. You will see boats out in that area late in the day, and they come back in just after dark. So, I am guessing there are fish there if you can figure out the when, where and with what details. I've stayed in the one of the sound front houses in Sandy Bay for that last 5 years or so. We first tried our gigging stuff there and never see anything, I've also wade fished out there an never caught anything. Go at night down around the flats behind the coast guard station (you'll need an Off road pass). Best conditions are a high tide, with an East wind coming off the ocean. If there are ripples in the water or chop, it will be tough to see. Don't be afraid to get in waste deep water as long as you can see. Look for flounder footprints in the sand. There's some big ones out there. We plan to head out to some shoals at night this year when we're down in September. Please report back during your trip! Also, be careful using Google maps satellite images for locations of shoals by the inlet. It says 2018 images on googlemaps.com but Google Earth shows the exact same images are from 2/19/2017. If you're using a rough guideline, you should be ok.
Yup, good point. Especially around the inlet. For breakfast, go get an apple ugly or two at Orange Blossom in Buxton, get there early. The croissant sandwiches are also good. Diamond Shoals in Buxton does good breakfast with big pancakes. Nino's Pizza in Avon makes a good calzone. Oceana's Bistro in Avon is a good dinner spot that won't break the bank. The Quarterdeck in Frisco is good for seafood dinner, place has been there for a long time. Consider eating at the Frisco Sandwich Co. I have never had a bad meal there and if they still have fish taco Friday, jump on it.. Have you seen my pickle? Post back with a report please as this looks good! you'll do good here. don't think we've ever been skunked on foot. Got any picutres of you boat? I'm planning on mounting our lights to the bow of my boat for this year. Had many a fun and productive day from King's Point. This time of year most fishing is going to be early morning and late afternoon. There will be an early morning (first light) and late evening (dusk) speckle trout bite in the transition zone between a grass flat and a deep hole or channel. 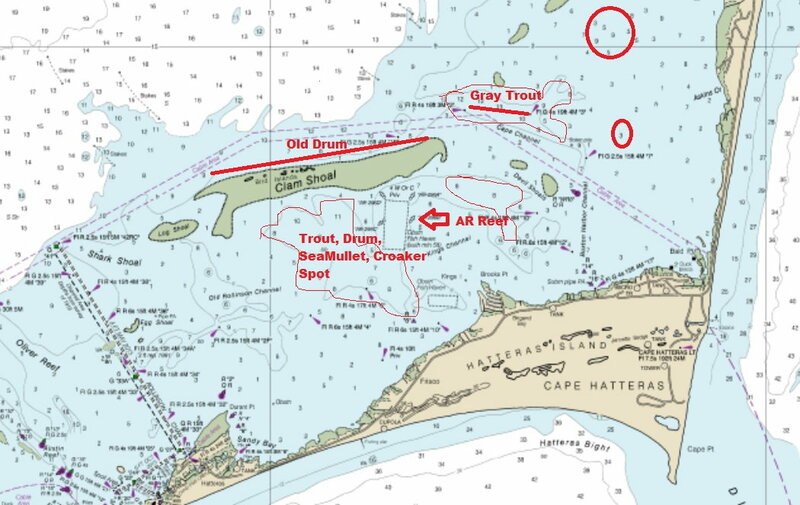 There will be schools of "old drum" running the drop-offs that move onto the grass flats in the late afternoon- that area of the one fathom line to two fathom line west side of Clam Shoals and the west side of clam shoal where it drops into the deeper water. Drift the two fathom break for flounder. All this rain may have them already making their annual exit towards the inlets. The "reef" is AR 296 good early morning and late evening fishing for a multitude of species- sometimes some nice sheepshead and black drum. You might check this out and do some digging as there is one nearby that isn't listed on the map (I don't know if the buoys are still there or not). I've never personally fished with Rick. His dad is an old friend of mine and if Rick is anything like his dad, you won't find a nicer guy who is local and grew-up fishing these waters. Last edited by Rick S; 08-09-2018 at 09:49 AM. Thanks Rick, for the information. That thread you linked at NCWaterman is depressing. :-( It is hard to believe anything survives that kind of pressure.